Should I Go to a Hospital or a Dentist for My Dental Emergency? Maybe you got hit in the face and your tooth is loose or has even fallen out. Or maybe you have tooth pain so severe, you don't know how you're going to make it through the day. Dental emergencies can occur at any time. You might be unsure about whether you should go to a hospital or a dentist for a dental emergency. The answer actually varies. Like other medical emergencies, dental emergencies require different levels of care, depending on their severity. Where you go for treatment when you have a dental emergency depends on the type of emergency you have. Dental emergencies or traumas involving the face and mouth that require immediate medical attention include jaw fractures, jaw dislocations, serious cuts or lacerations to the face and mouth, or an abscess or infection that is very swollen or affecting your breathing or swallowing. These are situations where you'd want to call 911 or go to a hospital emergency room. Don't wait for the dentist's office to handle a potentially life-threatening condition. There are other dental emergencies that are not considered life-threatening but that still may require immediate care. If you crack or break a tooth (such as while eating something crunchy) or you get a tooth knocked out, unless it's causing a lot of bleeding or happened as a result of a violent injury (like being punched in the face), you can probably wait for the dentist to handle these. While the pain of a decayed or abscessed tooth may be serious, unless it's affecting your ability to breathe or swallow, it probably doesn't rise to the level of an emergency. Make an appointment to see your dentist as soon as possible. If the discomfort from a decayed tooth includes sensitivity to hot and cold foods, this generally doesn't signal a serious problem. The sensitivity may be caused by a small decay, a loose filling, or by minimal gum recession that exposes small areas of the root surface. Try using toothpaste made for sensitive teeth. Brush up and down with a soft brush; brushing sideways wears away exposed root surfaces. If this is unsuccessful after several days, see your general dentist. If the problem causing your tooth pain is pulp tissue damage, your dentist may send you to an endodontist who ​specializes in pulp-related procedures. Your endodontist will perform a procedure that cleans out the damaged pulp and fills and seals the remaining space. You've probably heard of this procedure: it's more commonly known as a root canal. 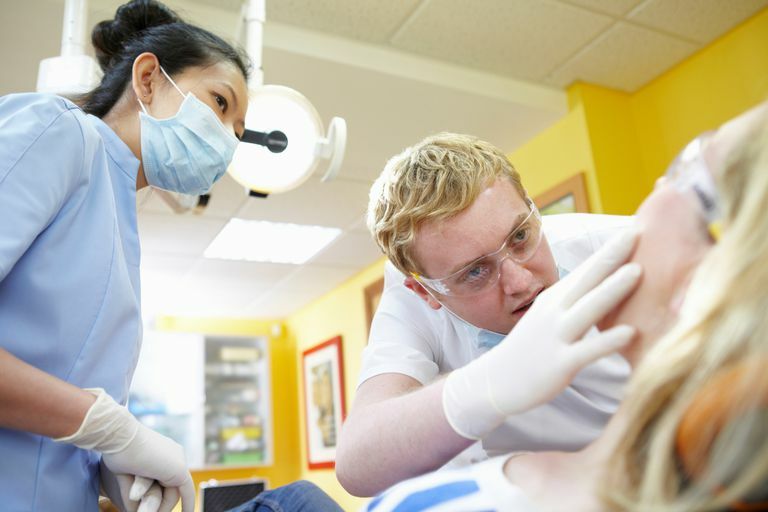 Dental emergencies don't always occur when your dentist's office is open. If the dental emergency occurs during non-business hours, on a weekend, or a holiday and it's not considered life-threatening, always try calling your dentist before pursuing alternative care options. Many dentists provide their patients with after-hours emergency care or an on-call substitute recommendation. In cases where a dentist is not able to see you after hours but you still require treatment from a medical professional, go to the nearest healthcare facility in your area.